LG releasing Windows Mobile 7 phone in September, Android 2.1 in April | Android Blast! There has been no official release date for Windows Mobile 7 and the world has been anxiously awaiting Microsoft's next move in the mobile space. 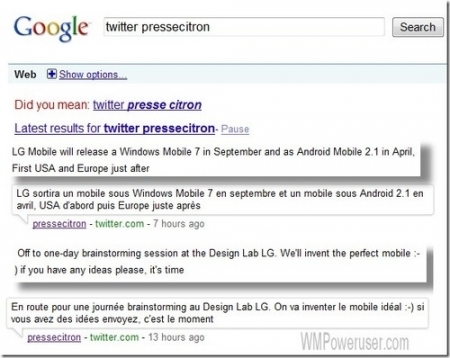 This weekend French tech blogger Eric of Presse Citron, tweeted from the LG Design Lab that the company will release a Windows Mobile 7 phone in September. The Tweets have been removed, but WMPowerUser was able to get a capture of it, and retrieve it from the Google cache. Interestingly, he also tweeted that an Android 2.1 device would be released by LG in April.